At a ceremony on November 8,Beijing, the ARC Centre for Particle Physics at the Terascale (CoEPP) and the Institute of High Energy Physics (IHEP) announced the signing of a Memorandum of Understanding to establish scientific exchange, collaboration and cooperation between the two organisations. This agreement will see scientists share their expertise and collaborate on a number of activities for mutually beneficial outcomes. In particular, the planned Circular Electron Positron Collider (CEPC) provides enormous potential for collaborative activities between the two organisations. IHEP is China’s premier research institute in particle physics, astroparticle physics and accelerator science. It manages a number of China’s major scientific facilities, including the Beijing Electron Positron Collider (BEPC), the Beijing Synchrotron Radiation Facility (BSRF) and Daya Bay neutrino experiment. CoEPP is Australia’s primary centre for particle physics research and brings together researchers from the Universities of Adelaide, Melbourne, Sydney and Monash. Its scientists work on Belle II (KEK, Japan), ATLAS (CERN, Geneva) and lead the development of Australia’s first deep underground Physics laboratory (Stawell Underground Physics Laboratory). “This formalisation of a partnership with IHEP is a great step for Australia. 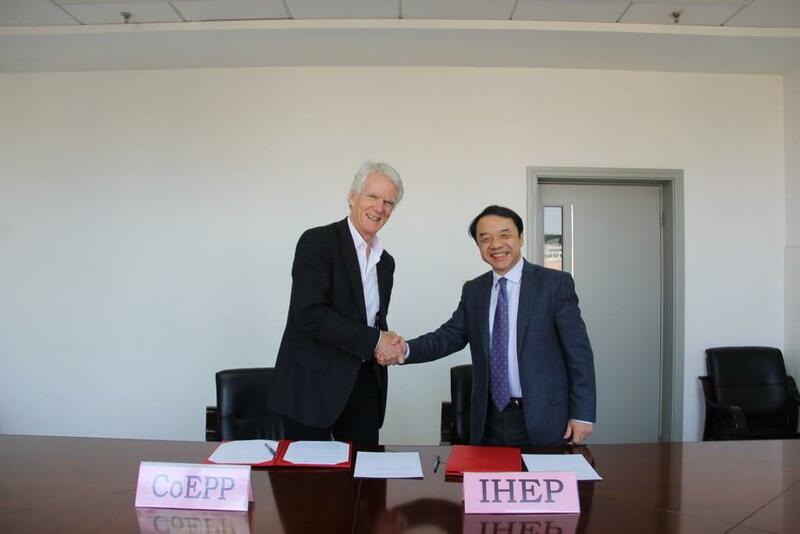 We share a great many research interests and I look forward to many years of successful collaboration with our colleagues at IHEP.” Says CoEPP Director Prof Geoffrey Taylor.